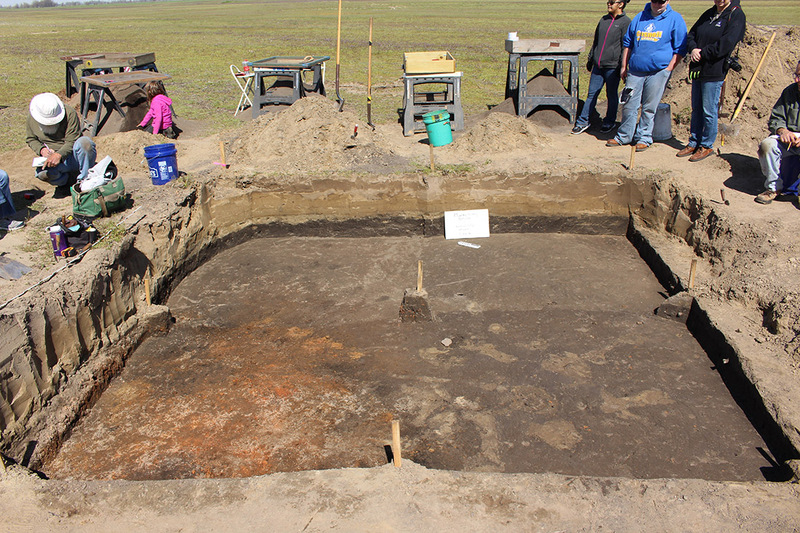 Figure 1: Base of level 2 in all excavation units. The daub fall from the house wall is showing up well in Unit 6 (bottom left) and bioturbation (rodent burrowing or tree roots) is showing up in Unit 7 (bottom right). This evidence of bioturbation gives further cause to want to investigate our previous dates further as one of the samples was taken 10 cm to the south of Unit 7 in a previous excavation. 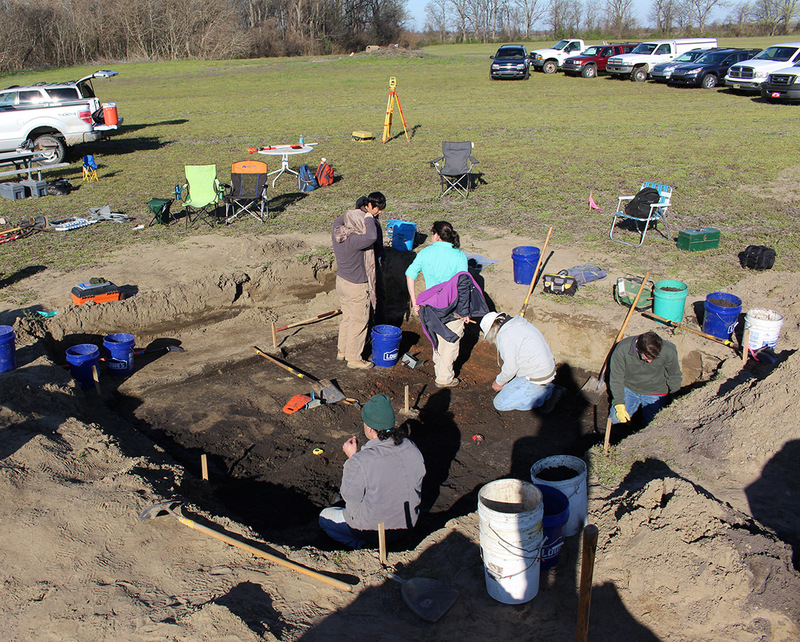 During spring break in March 2016, we conducted another week of excavations at the Manley-Usrey site in Blytheville, AR. In previous excavations we have shown that a large portion of the site is covered in up to a half meter of sand caused by a sand blow (which is an effect cause by large M6-8 earthquakes). We also ran AMS dates on two samples of nut shell identified in flotation samples taken from the top 10cm of the midden layer directly below the sand layers. These dates came back later than what we had expected based on the look of the weathering in the sand and the context of the artifacts. We didn’t see any obvious evidence of contamination in our samples, but we did wonder about the accuracy of the dates. We also uncovered the southern part of a structure in the 2014 excavation trench, so we wanted to try to uncover more of that structure. The 2015 excavation was planned to try to find the northern edge of the structure and some architectural features of how it was built (post holes or a wall trench), the hearth (if it was, as we suspected, a house), and some good in situ carbon to take as a sample for further AMS dating to confirm or further question our previous dates. Figure 3: The hearth has been bisected and half of the fill removed. Part of the floor was also burned and solid (orange area extending away from the bowl-like hearth). An in situ wooden post was also found next to the hearth (black spot on the right near the edge of the hearth). Because we knew how deep the midden level was from the previous work, we were able to bring in a backhoe to strip the sand off of the top of the area that we were going to excavate. 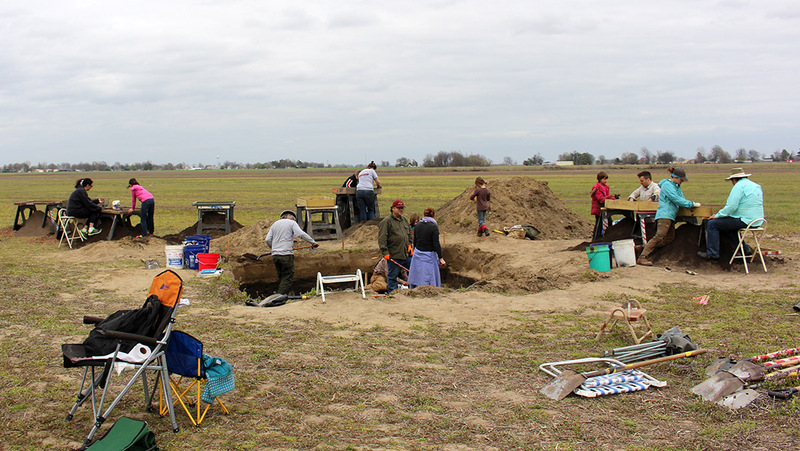 After the sand was gone, we were able to clean up the midden surface, take photos and begin excavation. 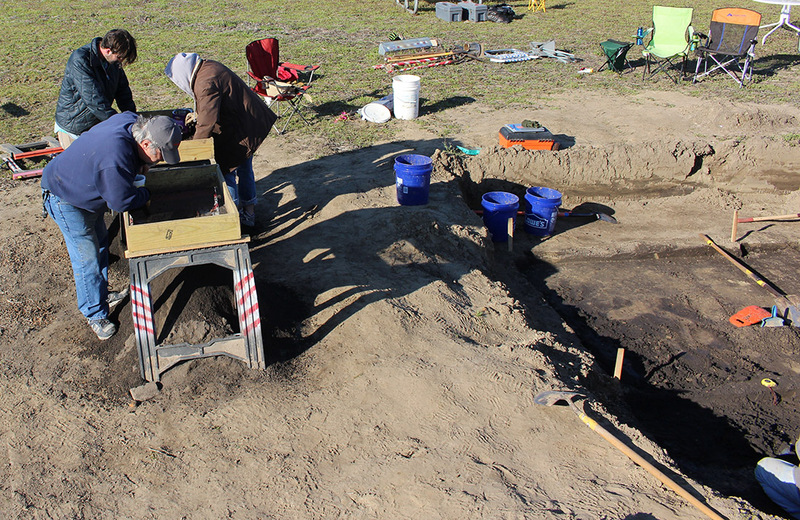 We split the area into four 2m x 2m units, but we tried to dig each unit at the same rate so that we could get overall pictures of the area at the end of each level (Figure 1). In this way, we were able to see a line of daub-covered and not daub-covered area that probably represents where the edge of the house was when it was standing. Within the daub fall of the wall, we also found a piece of burned, in situ cane that we were able to take as an excellently provenienced carbon sample for future dating (Figure 2). 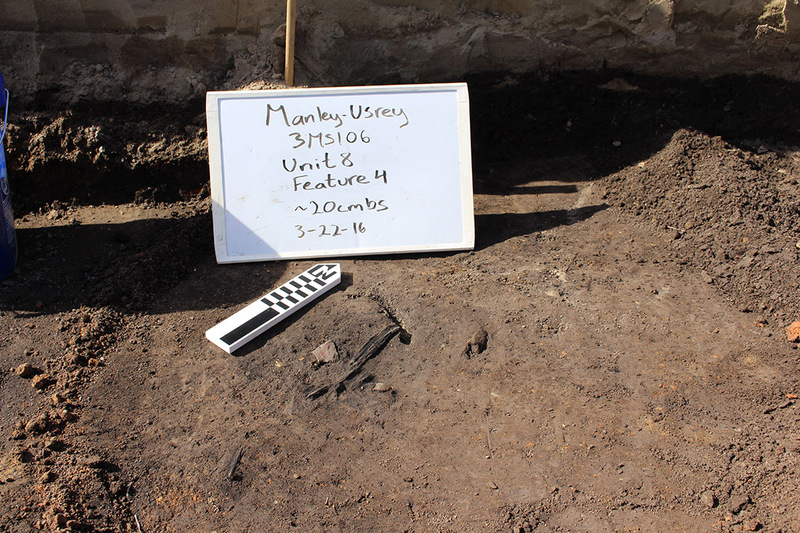 At the south edge of the excavation block we also uncovered the hearth (Figure 3). We took out the balk wall that we had left from the trench in 2014 and were able to see the entire structure (meaning we just barely missed it in the last attempt L) (Figure 4). The hearth was very interesting because not only was it differentially burned to different temperatures from the top to the bottom, but it had a second hardened layer underneath the first in some sections. It appears that part of the bowl was re-lined at some point by the people living in that house before continuing to be used. It seems as though the hearth was cleaned out before the structure was burned, though, because there was very little ash inside of the bowl, mostly just daub that fell from the wall or roof, though we did collect a sample of it for flotation just in case there was anything interesting left in it. Crew members David Hill, David Jeane, Jeff Mitchem, Kathryn Bryles, and Anna Jones. Crew: Melinda Martin, Larry Porter, Anna Jones, Sarah Stuckey, Scott Akridge, Elizabeth Horton, Jake Dunahue, Brandy Dacus, and Jeff Mitchem. 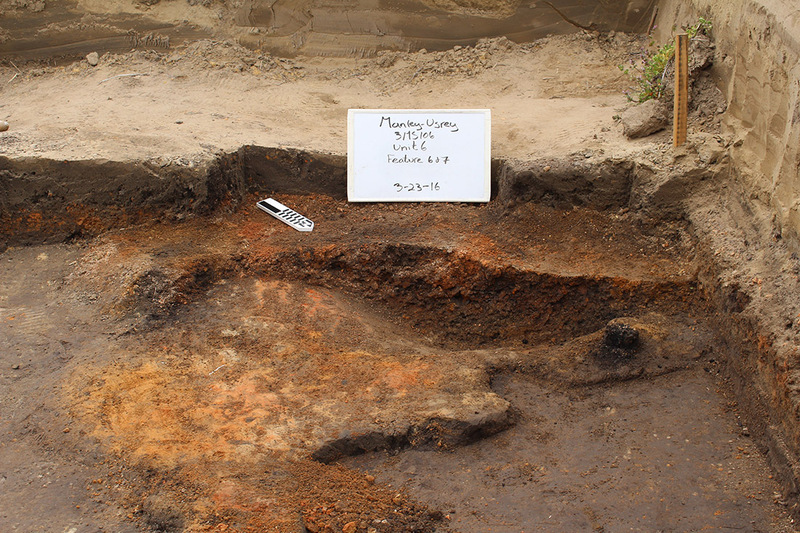 Figure 4: 2014 excavation trench that just missed the hearth. 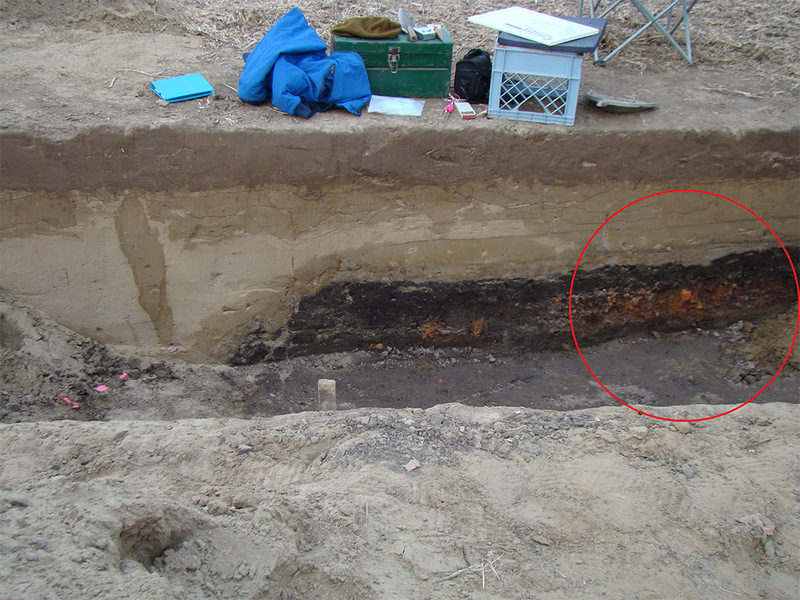 The area inside the red circle is the balk wall that we removed in 2016 to see the entire hearth feature in figure 3. Crew members Steve Jacober, Grant Williams and Nicole Reynolds. Figure 2: Carbon sample of cane found underneath daub fall on the south edge of Unit 8. Although the week was very successful, there were a few problems. First, we never found any post holes or a trench near the edge of the wall. The wall must have stood up somehow, but we didn’t see the evidence of it. We did find some post holes further to the NE, but they aren’t in a pattern that would indicate a wall and are about a meter from where we thought the wall was, so they don’t seem to be associated. We also found an obnoxious amount of bioturbation throughout all four units, but especially in unit 7, just to the E of the structure (Figure 1 is an example, but that kept going all the way to our last excavation level and beyond). As we began excavating, we first thought that we might have encountered a looter hole because the area was so large and was generally round. As we followed the levels down, we began to see offshoots of the main hole that could indicate that it was once a tree. The fact that there were artifacts moved into some of the disturbed areas from the west to the east and that some of the runs were still hollow seem to indicate that at least at the last point, rodents of some kind lived there. They had really destroyed the context of everything in that unit, and if there had been post holes or a wall trench there, they destroyed the evidence of it. 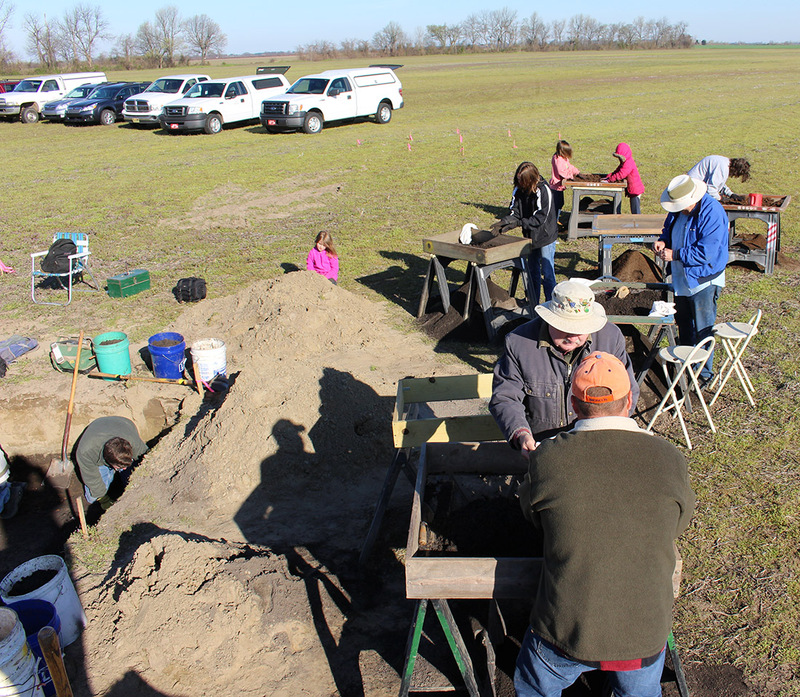 Overall, though, we learned a lot from this excavation and will be able to get very reliable dates from the cane that was found. We had a great crew of new- and old-timers who worked really hard to get everything done in a week so that the farmer could get his field planted the following weekend. I hope to be back out for another round of remote sensing and one more excavation (next year, hopefully) before the whole thing is written up as my dissertation research, so if you’re interested, get in touch. Marion Haynes, who helped to plan the entire event, ran the backhoe and let volunteers stay in the various outbuildings around his house, as well as (in no particular order): David Jeane, Larry Porter, Elizabeth Horton, Don Bragg, Jeff Mitchem, Lora Anderson, Anna Jones, Sarah Stuckey, Brandy Dacus, Steve Jacober, Scott Akridge, Melinda Martin, William Mitchner, and Jake Dunahue, and University of Arkansas students: Nicole Reynolds, Grant Williams, Ben Jacobs, Kathryn Bryles, David Hill, Sarah Hunt, and Carmelita Angeles.